Our single story, smoke-free condo is perfectly located on a green belt where guests are not disturbed by early morning golfers. Our back patio catches the morning sun and evening shade. We have a spacious backyard for children to play without the dangers of flying golf balls. Our condo overlooks one of twenty pools within this luxurious gated community. The 18-hole, par 72 championship golf course is suited for every level of play. Other features include a driving range, putting green, chipping area and a practice bunker all within walking distance of the Oasis bar and grill where golfers can stop and relax for lunch and refreshments. The Country Clubhouse is 42,000 sq. ft. with full service dining and live music to dance the evening away. 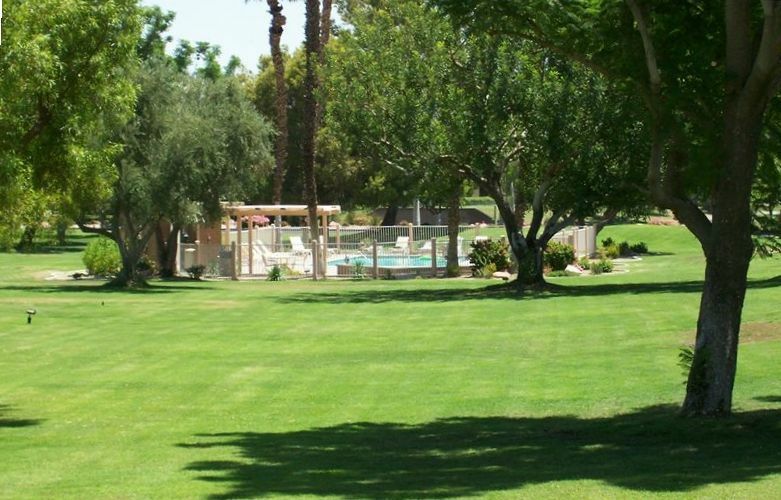 Everything you may need or desire is available within the Palm Desert area: shopping on El Paseo drive, fine dining at several night clubs, or 4 casinos for a lot of excitement, within a 10 mile radius. Come join us in this land of Paradise!!! I am a retired Convention Trade Show coordinator. I purchased this vacation home in 1994 in preparatin for retirement. I enjoy sharing this lovely location with fellow golfers that would like to relax and enjoy a small part of paradise on earth. Enjoyed our stay. Clean and just what we needed. Owner great to deal with. The location was great and the neighbors were the best. We have stayed in quite a few vacation rentals in Palm Desert, this being the worst. We didn't mind that it hasn't been updated, but the kitchen is not equipped well, needs a deep cleaning and new pots and pans. Just needs some TLC overall. Needs updating, a thorough cleaning, & extermination. Very old & uncomfortable furnishings. The living room couch was very uncomfortable. When opening living room blinds, several would fall down. Patio furniture was dirty. Microwave was one of the first to be made. Electrical plug in kitchen didn’t work. Ants in both bathrooms. Ice maker didn’t work. Tiny TVs. Slow Wi-Fi. Called owner for Wi-Fi info & he never called back. Neighbor helped us find log in information. There were no instructions to operate TVs. Carpets had been cleaned, but we had to put end tables & chairs off the bed. No instructions for leaving were left. Inside of kitchen garbage container was very dirty. The location was very good for where I wanted to go. Shower slick & no grab bar. The mattress pad was dissentigrating, so it was lumpy & slid around. This place needs to be updated & thoroughly cleaned. It was even more than what we expected. Quiet environment, well located and the patio had some shade most of the day to rest from the 100F that happened during our stay. The owner corresponded very quickly with us if we had any questions. great location, great view and discount golf. Very central location for all recreation and amenities. * June-October are subject to Air Conditioner charges being added to the bill. ** A stay of 28 nights or more are not subject to the 11% tax rate.